This family-friendly Mason hotel is within 1 mi (2 km) of Beach Waterpark and Lindner Family Tennis Center. Kings Island is 1.6 mi (2.6 km) away. If you're looking for a great (and cheap!) hotel in Cincinnati, CheapTickets is the best place to find them. We offer deals on the best 186 hotels throughout Cincinnati. No matter what you're looking for, we have options for you. Grab great rates on the 63 affordable 3-star hotels that are easy on the wallet without sacrificing comfort. Looking for more luxury? Try one of the 6, 4-star hotel accommodations in Cincinnati. No matter your budget needs, we've pulled out all the stops to make sure you have plenty of vacation options. Maybe you prefer to search for your hotel deals based on what each hotel offers? For example, let's say you just want to find a hotel or resort that has a pool to cool off in after a long day exploring Cincinnati. Scroll down to choose from the 137 hotels in Cincinnati that has a pool for guests. Or search for deals on Cincinnati hotels offering free wifi or breakfast, non-smoking rooms, and more! CheapTickets is here to be your personal travel agent for your next trip to Cincinnati. Get booking today! What hotels in Cincinnati offer free wifi access? Are there deals on Cincinnati hotels offering free breakfast? Yes! The only thing better than finding a great deal on a cheap hotel in Cincinnati is finding one that offers free breakfast. Grab some eggs, a waffle, or some healthy oatmeal before a day full of exploring Cincinnati and all that it has to offer. Below are just some of the many hotels that offer free breakfast in Cincinnati. Best Western Mason Inn is a 2.50 star rated hotel property in Cincinnati that offers free breakfast. Quality Inn & Suites Cincinnati Downtown is a 2.50 star rated hotel property in Cincinnati that offers free breakfast. 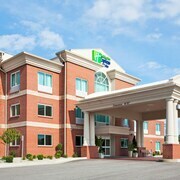 Holiday Inn Cincinnati-Riverfront is a 3.00 star rated hotel property in Cincinnati that offers free breakfast. Extended Stay America Cincinnati - Fairfield is a 2.50 star rated hotel property in Cincinnati that offers free breakfast. What about deals on pet-friendly hotels in Cincinnati? Cincinnati is a great place to get outside and explore with your pets in tow so don't leave your furry friends behind. Below you'll find great deals on hotels in Cincinnati that allow pets. Don't forget to bring plenty of treats! Quality Inn & Suites is a popular, pet-friendly, 2.50 star hotel in Cincinnati. Red Roof Inn Cincinnati East - Beechmont is a popular, pet-friendly, 2.00 star hotel in Cincinnati. Red Roof Inn & Suites Cincinnati North - Mason is a popular, pet-friendly, 2.50 star hotel in Cincinnati. Red Roof Inn Cincinnati Northeast - Blue Ash is a popular, pet-friendly, 2.00 star hotel in Cincinnati. Any good rates on Cincinnati hotels with restaurants? Absolutely. Don't want to deal with planning our all your meals on your trip to Cincinnati? We don't blame you. Keep the hangry away by staying in one of the 44 hotels that have restaurants. With a room at one of these spots, all it takes to get a good meal is hopping in the elevator. Check out some of the most popular hotels in Cincinnati that have restaurants below. Book Residence Inn by Marriott Cincinnati Downtown/The PhelpsResidence Inn by Marriott Cincinnati Downtown/The Phelps is a 3.50 star hotel and has one or more restaurant options. Book Marriott Cincinnati RiverCenterMarriott Cincinnati RiverCenter is a 3.50 star hotel and has one or more restaurant options. 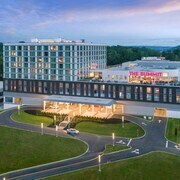 Book Super 8 by Wyndham MasonSuper 8 by Wyndham Mason is a 2.00 star hotel and has one or more restaurant options. Book Cincinnati Marriott NorthCincinnati Marriott North is a 3.50 star hotel and has one or more restaurant options. What are the cheapest hotels in Cincinnati with pools? What's better after a long day exploring Cincinnati then a relaxing dip in a pool? Finding the Cincinnati hotel you need for a bargain! Cool off and unwind at one of our 137 Cincinnati hotels with a pool. Browse some of the top deals on these hotels and resorts with pools in Cincinnati below, but be warned: You may not want to check out! Wave Hotels has a pool and a 2.00 star rating. Cincinnatian Hotel has a pool and a 4.00 star rating. LivINN Hotel Cincinnati / Sharonville Convention Center has a pool and a 2.50 star rating. Hyatt Place Cincinnati-Northeast has a pool and a 3.00 star rating. What hotels in Cincinnati offer parking for guests? Once you've made your way to Cincinnati, the last thing you want to deal with is finding parking close to your hotel. Avoid the hassle of parking around the block and carrying your luggage all the way to the lobby by booking one of our hotels with parking. Check out deals on some of the 136 hotels in Cincinnati that offer parking for guests. Best Western Plus Hannaford Inn & Suites This hotel has a 2.50-star rating. Wildwood Inn Tropical Dome & Theme Suites This hotel has a 2.50-star rating. Wingate by Wyndham - Cincinnati - Blue Ash This hotel has a 3.00-star rating. Hyatt Regency Cincinnati This hotel has a 4.00-star rating. Do Cincinnati hotels offer 24-hour concierge services? When you're on vacation, things don't always go according to plan. Travel with peace of mind when you book one of our 12 hotels in Cincinnati with 24-hour concierge service. That way you know help is always phone call or elevator ride away. Try Cincinnati Marriott North. It's a 3.50 star rated hotel in Cincinnati that offers concierge services 24 hours a day. Try Hyatt Place Cincinnati/Blue Ash. It's a 3.00 star rated hotel in Cincinnati that offers concierge services 24 hours a day. Try Millennium Cincinnati. It's a 3.50 star rated hotel in Cincinnati that offers concierge services 24 hours a day. Try 21c Museum Hotel Cincinnati. It's a 4.50 star rated hotel in Cincinnati that offers concierge services 24 hours a day. What about low rates on non-smoking hotels in Cincinnati? Homewood Suites by Hilton Cincinnati/West Chester This hotel has a 3.00-star rating. Hyatt Place Cincinnati/Blue Ash This hotel has a 3.00-star rating. Holiday Inn Express & Suites Cincinnati - Mason This hotel has a 2.50-star rating. Millennium Cincinnati This hotel has a 3.50-star rating. What are the cheapest Cincinnati 3-star hotel deals? Our 3-star hotels bring you quality accommodations at a lower price point for the perfect, budget-friendly vacation in Cincinnati. With 63 3-star hotels throughout Cincinnati to choose from, you still have options. Browse our selection below. 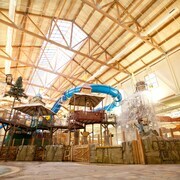 Great Wolf Lodge Cincinnati/Mason. This family-friendly Mason resort is within 2 mi (3 km) of Kings Island and Beach Waterpark. Lindner Family Tennis Center and The Golf Center are also within 3 mi (5 km). Millennium Cincinnati. Surrounded by downtown Cincinnati attractions, this 2-tower hotel connects to Duke Energy Center by an enclosed skyway. Fountain Square is 200 meters away, while the Paul Brown Stadium, the Great American Ball Park, and the U.S. Bank Arena are all within 1 km. Hyatt Place Cincinnati-Northeast. Situated in Mason, this hotel is within 6 mi (10 km) of Loveland Castle, The Golf Center, and Wall2Wall Soccer. Alverta Green Museum and Courts4Sports are also within 6 mi (10 km). Cincinnati Marriott North. Situated in the business district, this hotel is within 6 mi (10 km) of Trammel Fossil Park, Ohio Valley Antique Mall, and EnterTrainment Junction. Tri-County Mall and Sharon Woods Park are also within 6 mi (10 km). What are the best deals on 4-Star Hotels in Cincinnati? Cincinnati is full of hotels and it can be hard to narrow down where you really want to stay. Luckily, we've done that hard work for you be narrowing you from 186 hotels throughout Cincinnati, to the 6 4-star hotels in Cincinnati. Our 4-star hotels in Cincinnati are exactly what you need for your next family trip, romantic weekend, or solo getaway. Check out our most popular deals below. Cincinnatian Hotel: Located in Downtown Cincinnati, this historic hotel is steps from Contemporary Arts Center and Fountain Square. Carew Tower and National Underground Railroad Freedom Center are also within 10 minutes. The Westin Cincinnati: Overlooking the Fountain Square, The Westin Cincinnati is within easy reach of the Great American Ball Park, the Duke Energy Convention Center, the Underground Railroad Freedom Center, the Contemporary Arts Center and the Aronoff Center. Hyatt Regency Cincinnati: Located in Saks Fifth Avenue Center across from Duke Energy Convention Center, this hotel is 3 blocks from Paul Brown Stadium, 6 blocks from the Great American Ballpark, and 7 blocks from the US Bank Arena. 21c Museum Hotel Cincinnati: Located in Downtown Cincinnati, this luxury hotel is within a 5-minute walk of Aronoff Center for the Arts and Fountain Square. Carew Tower and National Underground Railroad Freedom Center are also within 10 minutes. We loved the location! It was perfect walking distance to many attractions. We liked the revolving restaurant but they had a limited menu due to Valentines day weekend, which was not listed on their website or we would have went somewhere else to eat. The door to our hotel room was open when we got to the room and it would not close without having to force it to close. The front desk told us to wait for maintenance to come and look at it. When maintenance did come they asked if we wanted another room, and that is what we had asked the front desk originally. They were able to get us a new room, but it was a hassle that guests should not have to go through. Daniel was very helpful and not sure where he was from, as he just showed up at the door. He even went and checked out our new room to make sure it was good. Can not believe they charge $12 for the breakfast when you get this free at other low scale hotels. Nothing fancy on it and it was a waste. Could have walked to McDonald's and paid much less and got better.